When spring has sprung, I’m always looking for great asparagus dishes…and sense pasta is in season all year long, why not combine the two. 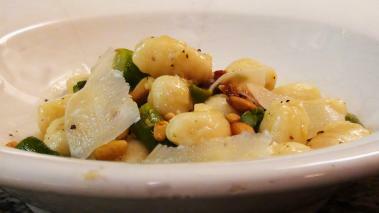 In this recipe video, I make a very fresh and light Gnocchi with Asparagus and Bacon dish. These little pillows of pasta are soft and delicious, and worthy of frequent trips to the dinner table. But often gnocchi recipes are supper heavy with thick rich sauces. And while I love a nice rich sauce, sometimes you want something a bit lighter and healthier – without sacrificing any flavor. This recipe fits the bill. Over cooked Gnocchi may be the worst of all over cooked pastas – they just turn into mush, so make sure you don’t over-do them. Drain off the Gnocchi and add to the sauté pan, the butter and season with salt and pepper and toss for about 30 seconds. Check the consistency of the sauce, it should be nice and thick – you add more stock, or let it continue to reduce to either thin or thicken it. Wine Pairing: Asparagus can be really hard to pair a wine with, but I think you've got a good bet with a Sauvignon Blan, or with a Chardonnay. Find a great pairing at Into Wine. Hope you enjoy this recipe for Gnocchi with Asparagus and Bacon. Obviously, it’s easy to swap out other vegetables in this dish (to keep it seasonal all year long), or change up the other herbs or even meat. Leave me a comment and let me know how it goes.